Whenever I travel abroad and tell people I am from Canada, most of the time I get a physical response from the other person: holding their arms and motioning “brrrr”, or sometimes pointing upwards (i.e. north) in a somewhat ridiculous motion. If there is one thing we specialize in as Canadians, it’s being cold and north. The Arctic wraps around 75 per cent of Canada’s coastlines and is 40 per cent of its total land mass. And now, more than ever, the world is looking at the Arctic as a key transit way – the new thoroughfare that will dramatically cut down logistics time and remove the necessity to travel through complicated canals. With that, however, comes a much harsher environment and unique complications which have to be solved with innovative technology. It would take the North much longer to recover from catastrophic environmental events, so truly unique technologies are required. The following are just a few examples of Canadian innovations in this area. Weatherhaven, the Canadian SME that was recently awarded the $168 million Headquarter Shelter Systems (HQSS) to replace up to 80 per cent of the National Defence’s Expandable Modular Tent System structures sells a “Polar Shelter”, which is made of a unique Polar fabric which is used in places like Antarctica, the High Canadian Arctic & Greenland. The Canadian Federal Government has an RFP ready to go called ESCP (Enhanced Satellite Communications Project), which will be a pair of elliptical orbit satellites at medium earth orbit that spin 90 degrees to conventional satellites and thus pass over both poles. This project will provide communications and surveillance in the North. The Arctic’s extreme northern latitudes and polar ionosphere create issues for sensors and communications, rendering critical navigation technologies like GPS unreliable. Two potential bidders for ESCP are ViaSat and MDA. ViaSat’s upcoming satellite model, the ViaSat-3 is due to enter service in 2019/2020, which aligns with the Government of Canada’s procurement timeline. The underlying technology is a strong contender for ESCP; ViaSat-3 leverages 3 satellites in geostationary orbit to provide bandwidth exceeding 1000 GBPS. MDA’s RADARSAT is used to monitor Arctic activity and assess climatic and ice conditions. “MDA has been providing space-based data and information products to the Government of Canada’s Arctic sovereignty mission for over 40 years,” said Mike Greenley, Group President of MDA. “Our radar satellite data and maritime domain awareness solutions enable Canada to continuously monitor human and vessel Arctic activity as well as providing key data sources for population, wildlife, climate, and ice flow analysis.” In the last 20 years, RADARSAT 1 and RADARSAT 2 have taken over 7500 images in Canada’s Arctic region. 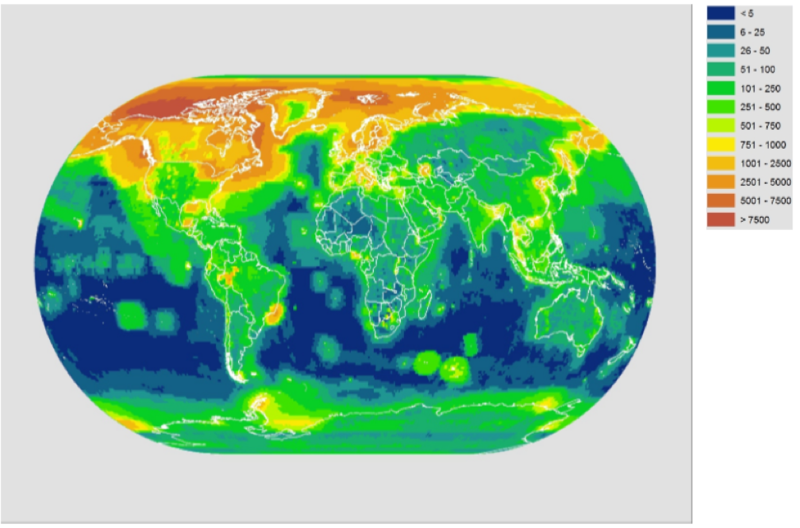 Diagram showing density of MDA’s radar imaging over the last 20 years. Note the high levels of activity in the Arctic. 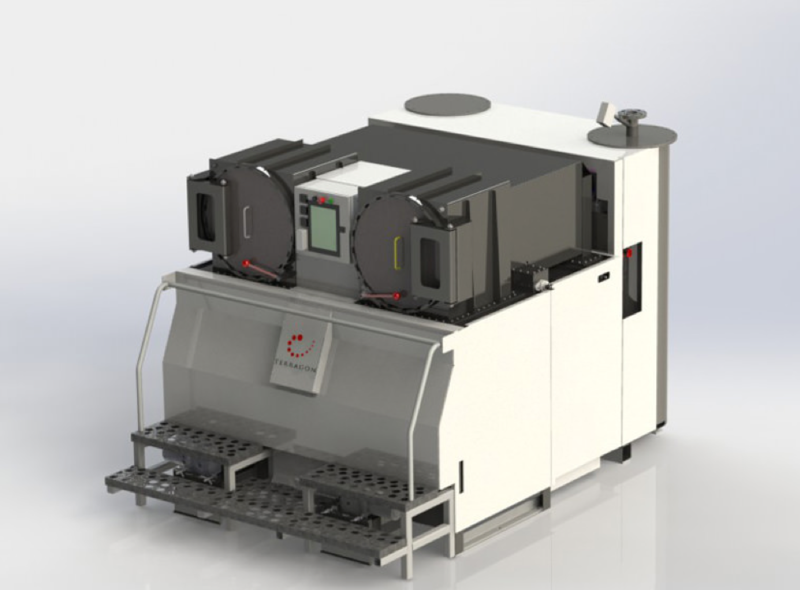 Another Canadian technology that is key to solving the challenges the Arctic poses to traditional communications/navigation/surveillance technology is the sigma S6 Ice Navigator, a special ice navigation radar technology, made by Canadian SME, Rutter. The Arctic can be an alien terrain full of ice, water, and everything in-between. 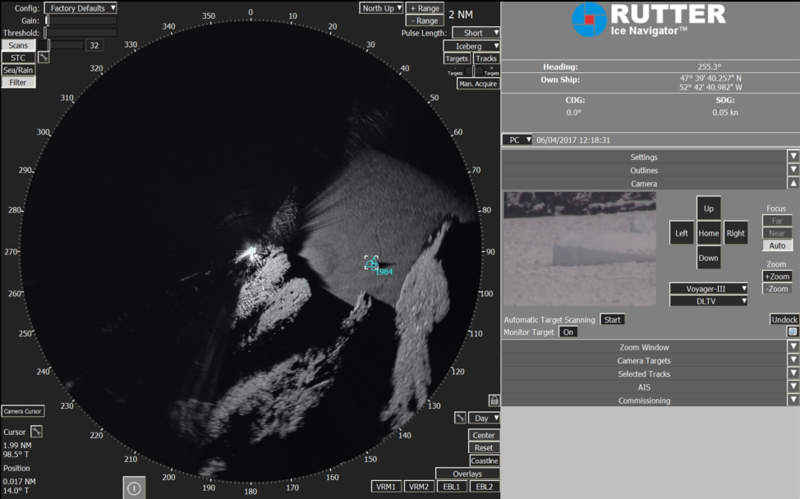 Rutter’s Advanced Ice Analysis boasts the most comprehensive view of the environment including detection of ice ridges, icebergs embedded in pack ice, open water leads and coastlines. The refinements to Arctic situational awareness spans a range of sea states, weather, and daylight conditions, averaging 32 scans and tracking up to 1000 targets simultaneously, allowing operators to make real-time and predictive decisions. The sigma S6 integrates with most existing marine radars and eliminates the need for a separate system for ice navigation. High-altitude, long-endurance (HALE) unmanned vehicles are also needed in the Arctic for surveillance. Northrop Grumman and General Atomics Aeronautical systems are currently the most mature systems that could be deployed, of which both companies would have to provide high tech ITBs and include Canadian SMEs in the process of innovating to provide these platforms. In addition, International Submarine Engineering develops and manufactures autonomous and remotely operated robotic systems across subsea, land, space, and in the Arctic. ISE built the first autonomous underwater vehicle (AUV) to lay fiber-optic cables on the seabed – doing so across 200 kilometres at a depth of up to 600 meters in 1985 in the Arctic. Since then, the AUVs have become deeper-diving, longer-range, and more modular to transport. Advancements in homing technology also allow the AUV to pair with a moving beacon (given that the Arctic is a constantly changing landscape) and to recharge, upload data, and receive new travelling instructions at the same time. 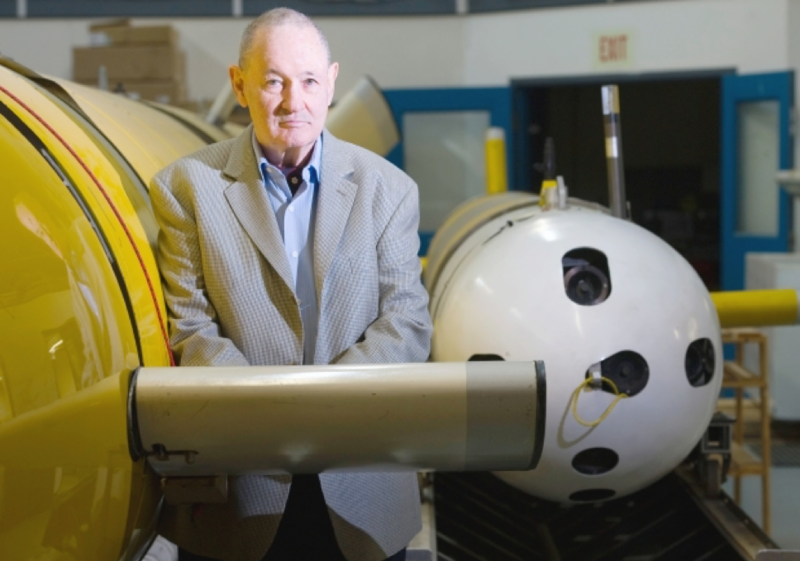 International Submarine Engineering president James McFarlane with one of his submarines in the company’s Port Coquitlam facility. (Source: Vancouver Sun). Virtually the entire ice-breaking fleet, operated by the Canadian Coast Guard, will likely be replaced in the next decade, which offers an opportunity for even more Canadian innovations to be included as a part of that replacement process. One example in shipbuilding is Canadian SME, Terragon Environmental Systems, which has a very unique innovation called the MAGS V8, which is the only deployed marine garbage disposal system that meets the new environmental regulations for the Arctic. The MAGS V8 in use, an innovative technology made by Canadian SME from Quebec, Terragon Environmental Technologies. Never has there been a better time or place to innovate in Arctic-related technologies. This is certainly something Canada has and should continue to “own” and not let the opportunity to lead innovation in this sector slip through our fingers. There will be a lot of activity coming up – a big opportunity for Canadian technology.